European Science Cluster of Astronomy & Particle physics ESFRI research infrastructures (ESCAPE) has received funding from the European Commission Framework Programme Horizon 2020 Research and Innovation action under grant agreement n. 84064. H2020-ESCAPE aims to address the Open Science challenges shared by ESFRI facilities (CTA, ELT, EST, FAIR, HL-LHC, KM3NeT, SKA) as well as other pan-European research infrastructures (CERN, ESO, JIV-ERIC, EGO-Virgo) in astronomy and particle physics research domains. The official project launch date is 1 February 2019. The project has a runtime of 42 months and it will be coordinated by CNRS-LAPP, Annecy. 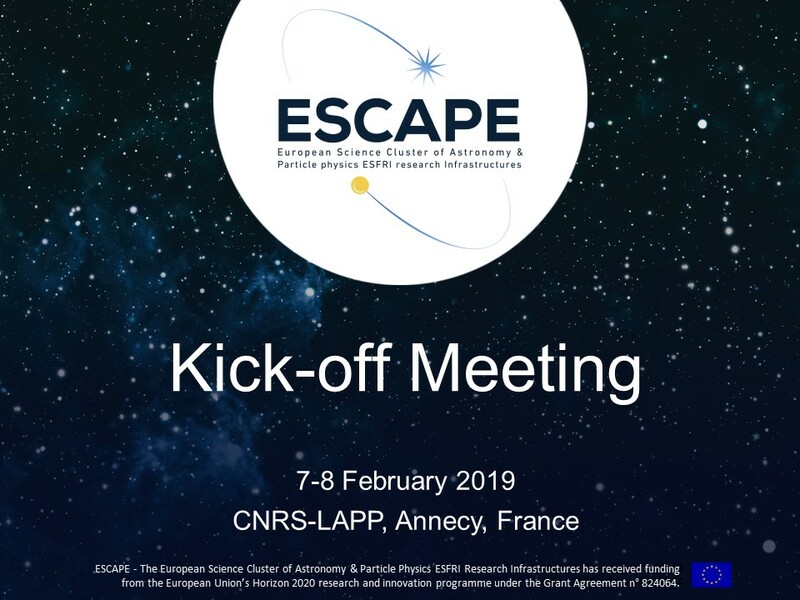 In view of the project launch, CNRS-LAPP, the coordinator of the H2020-ESCAPE project is pleased to invite all the project partners to the ESCAPE Kick-off meeting in Annecy, France from 7-8 February 2019. This two day meeting will be an opportunity for all the 31 European project partners to present the planned workpackage activities as well as discuss the project plan. 7 February 2019 : First day of the meeting agenda will present the planned work-packages activities as well as presentations from the participating ESFRI and other world-class astronomy and particle physics research infrastructures. These discussions will be open to all the participating staff members of the ESCAPE partners. First day shall conclude with a kick-off celebration accompanied by a cocktail and social dinner. 8 February 2019 : Second day of the meeting agenda includes the first General Assembly meeting as well as the first Executive Board meeting to implement the project governance plan. The General Assembly meeting will have one representative from each partner. Whereas the Executive Board meeting will be limited to the workpackage leaders.